There are 6 articles included in this FILE they are separated by a line of **** . Lots of information & additional links included in this so read it all ! The following is a statement from major Diatomaceous Earth (DE) supplier PermaGuard. To purchase Diatomaceous Earth, please visit PermaGuard’s website. Diatomaceous earth is a remarkable, all-natural product made from tiny fossilized water plants. DE is a naturally occurring siliceous sedimentary mineral compound from microscopic skeletal remains of unicellular algae-like plants called diatoms. These plants have been part of the earth’s ecology since prehistoric times. It is believed that 30 million years ago the diatoms built up into deep, chalky deposits of diatomite. The diatoms are mined and ground up to render a powder that looks and feels like talcum powder. DE is approximately 3% magnesium, 33% silicon, 19% calcium, 5% sodium, 2% iron and many other trace minerals such as titanium, boron, manganese, copper and zirconium. Diatomaceous Earth is a natural (not calcined or flux calcined) compound. Many harmful things entering the body have a positive charge. Silica is a semi-conductive mineral which when warmed by body heat becomes negatively charged and gives off electrons. These negatively charged mineral ions and/or individual shells attract bad microbes, free radicals, positively charged waste and other harmful things. Acting as magnets, the negatively charged shells and/or ions attract and absorb positive things that are small enough to go through the holes. Add a sugar molecule and you can trap toxins into the porous food-grade DE particle which is then excreted safely out of the body. Because of the strong charge, each shell can absorb a large number of positively charged substances, whether they be chemical or in the form of bacteria or viruses. They pass on through the stomach and intestine, taking these harmful substances out of the body. 1) As it moves through the stomach and digestive tract, it attracts and absorbs bacteria, fungi, protozoa, viruses (including poliovirus), endotoxins, pesticide and drug residues, E-Coli, heavy metals (including methyl mercury) and protein, perhaps even the proteinaceous toxins produced by some intestinal infections. These toxins are trapped and passed out of the body. In addition, any larger parasites that happen to be in the stomach of digestive tract are “cut up” and killed by the sharp edges of the DE (but DE does NOT kill the beneficial bacteria in the gut). All of these activities result in a much healthier body with less sickness. Many DE users claim to “feel better” with the use of DE. This better feeling comes from all the “junk” being removed from the body and by giving our immune system the “jump start” it needs. Regular bowel movements (This is the #1 comment users make about DE). Healthier Colon. This is especially important as we get older. A clean healthy colon keeps away polyps, cancers, and ulcers. Today, many are spending thousands of dollars to get colonics to do the same thing as DE does. Many users report increased energy and needing less sleep. This is a result of all the food and nutrients that are taken in being better absorbed into the blood stream. With a coated colon many nutrients never get absorbed. 3) A small amount of Diatomaceous Earth gets absorbed into the blood stream as silica. One of the benefits of Silica is that it helps to destroy bad fats. On average, DE lowers cholesterol by 40-50 points. Many users have also experienced a decrease in high blood pressure. 2. Lower High Cholesterol. – Most are reporting 40-50 points lower after only 2 weeks on DE. 3. Sore joints feeling better – Osteoporosis is a symptom of the aging process. As calcium in our body system depletes, our bones become brittle and weak. Taking only a calcium supplement cannot correct or stop this threatening and crippling disease because the body cannot assimilate and make use of the calcium without the presence of silica. Evidence suggests that, instead of affecting healing, supplemental mineral calcium, on the contrary, accelerates the leaching away of bone calcium and thus hastens the degenerative process of osteoporosis and similar diseases that affect the supportive and connective tissues in the human body. For osteoporosis, silica can stop the pain and even restore the bodies’ self repair process. Silica is responsible for the depositing of minerals into the bones, especially calcium. It speeds up the healing of fractures and also reduces scarring at the site of a fracture. Even when calcium is insufficient, the body can turn silica into calcium that the bones need. 4. Healthier skin – Overseas, DE is used extensively as a health and beauty product for hair, skin, nails, bones, and joints. Tissue degeneration accelerates due to aging when connective tissue develops an increasing inability to retain moisture when left unassisted. Silica can help slow the degenerative process of connective tissue. With silica, vitality and life, which are often lost as the years accumulate, can be naturally maintained or even restored to your skin. Collagen, largely made up of silica, is the glue that holds us together. If our body has enough silica, the collagen will make us look younger. Silica helps with skin problems and injuries including itching, rashes, abscesses, boils, acne, calluses, warts, eczemas, burns, frostbite, benign skin sores, insect bites and bedsores. If you regularly follow a silica regimen, your skin will keep its young look. 5. Hair That Grows – Hair is nature’s greatest beauty enhancer. Hair deserves to be pampered. Hair at 90 micrograms per gram is almost as rich in silica as are healthy bones, which contain 100 micrograms per gram. Silica is a major component of hair. Using a good silica supplement (such as DE) should be part of your ongoing hair care program for revitalizing hair. Silica helps to prevent baldness, stimulates healthier hair growth and assures beautiful shine, luster and strength. 6. Teeth and Gums – Hardening the enamel, silica prevents cavities and preserves teeth. Silica also prevents bleeding gums, gum atrophy, and recession that cause the loosening of teeth, which could ultimately lead to tooth loss. Silica effectively fights ulceration and the decay of bones and teeth and also lessens inflammation. Silica works with other anti-oxidants to prevent premature aging and to preserve youthfulness. It acts as a cough-decreasing agent. Silica tones the upper respiratory tract (nose, pharynx, larynx) and reduces swelling because of its positive action on the lymphatic system. Silica supplementation keeps menopause free of stress and helps to prevent many unwanted side effects. Silica can help prevent kidney stones and heal infections of the urinary tract. It is a natural diuretic, which can increase excretion of urine by 30 percent, thus flushing the water-excreting system and restoring normal function to these vital organs. Natural food grade diatomaceous earth contains 15 trace minerals including calcium, magnesium, sodium, potassium, copper, zinc, iron, phosphorous, and selenium. Helps to control the glucose level. Works with magnesium to prevent muscle cramping. Aids in the development of the inner and outer ear. Works with magnesium in the control of hyper-kinetic and autistic behavior in children. Aids in nerve impulse transmission. Helps prevent tingling and numbness in the limbs. Works with zinc in the prevention of birth defects. The action of manganese is blocked by mercury. Zinc. Zinc is essential in the activation of over 80 percent of the body’s enzyme systems. Perhaps one of its most important functions is in helping to control glucose levels. It is also important in the growth of bone, and, along with magnesium, is vital in the healing process. Zinc is very important in childhood development. Chromium. Low levels of chromium are found in patients who habitually eat large amounts of carbohydrates. A high intake of carbohydrates will lower chromium levels because chromium is necessary in the activation of insulin and is part of what is known as the glucose tolerance factor. Most people do not get sufficient amounts of chromium from the foods they eat. It is necessary to be very strict about dietary control and taking supplementation. Potassium. Nearly all medications and drugs will upset potassium metabolism. Potassium deficiency and/or contamination are characteristic of MS patients, and is the number-two deficiency in the periodontal patient. There is NO one perfect way to take DE, everyone’s preferences are different. The following is a general suggestion for use. Start with 1-2 teaspoons per day mixed in some kind of liquid or food. There is no unpleasant taste. Since it will not dissolve, stirring several times while drinking will prevent settling. Gradually increase to 1-2 tablespoons twice a day. Some people take DE three times a day, but as a general warning some have experienced higher energy levels, so it is probably better not to take it right before sleeping. No worry about getting too much – any excess silica not needed by the body is automatically eliminated through the blood stream, kidneys and intestines. Face Mask and Cleanser: Mix DE and water together until you have made a paste. Apply to the face with circular scrubbing motion until face is fully covered. Leave on face for approx. 2 min. and then wash off with warm water. Your face will be fully exfoliated and toned for pennies!!! Mix DE with your favorite cleanser and you will have cleaner, smoother skin. Teeth Cleaner: Sprinkle a small amount on your favorite brand of toothpaste and brush as you normally would. You will notice that your teeth look and feel “just went to the dentist” clean. DE manufacturers who work in diatomaceous earth mines 5 days/week advise inhaling it is not a problem but it is still recommended to avoid breathing it whenever possible. Avoid getting diatomaceous earth in the eyes as it can be drying to the eyes. Direct contact with DE powder can be drying to hands and feet, just as it can be to your pets. Some parasites exiting the body are clearly visible in the stool. Some people choose to look and others don’t want to know. Obviously, this is a personal choice. Avoid using heavily in carpet for pest control as it has been reported that too much DE may cause vacuum problems. NEVER use pool filter grade DE on yourself or around animals. Some people experience a “healing crisis” (detox reaction) when beginning DE consumption. This discomfort may be nothing more than inflammation caused by a reawakening immune system as it detoxifies and begins to attack previously unaddressed chronic infections. According to one infectious disease expert, as some parasites are dying off, they release extra toxins into the system which can cause nausea, sharp pains, or cramping. Parasites can harbor their own smaller parasites, germs and infections (protozoa, amoebae, bacteria, viruses, etc), which are also released into the system which can increase the discomfort. Working up the amount slowly from about a teaspoon to a rounded tablespoon over a few days or weeks may help to avoid this situation. HYDRATION IS IMPORTANT, DRINK PLENTY OF WATER. If you use DE for insect control, remember it will kill beneficial insects (i.e. ladybugs) as well, so use accordingly. DISCLAIMER: These statements have not been evaluated by the Food and Drug Administration. These products are not intended to diagnose, treat, cure or prevent any disease. The statements are for informational purposes only and are not meant to replace the services or recommendations of a physician or qualified health care practitioner. Those with health problems, pregnancy or who are nursing are specifically advised that they should consult their physician before taking any nutritional supplement. Avoid inhaling this product. Diatomaceous Earth is made up of Diatoms which are prehistoric algae that is found in underwater beds of salt and freshwater lake and oceans. It is mined, milled and processed for different uses. The DE used in swimming pool filters and some other industrial uses has been heat &/or chemically treated, which changes the shape of these microscopic particles and makes it unsafe for use in or around animals or humans. 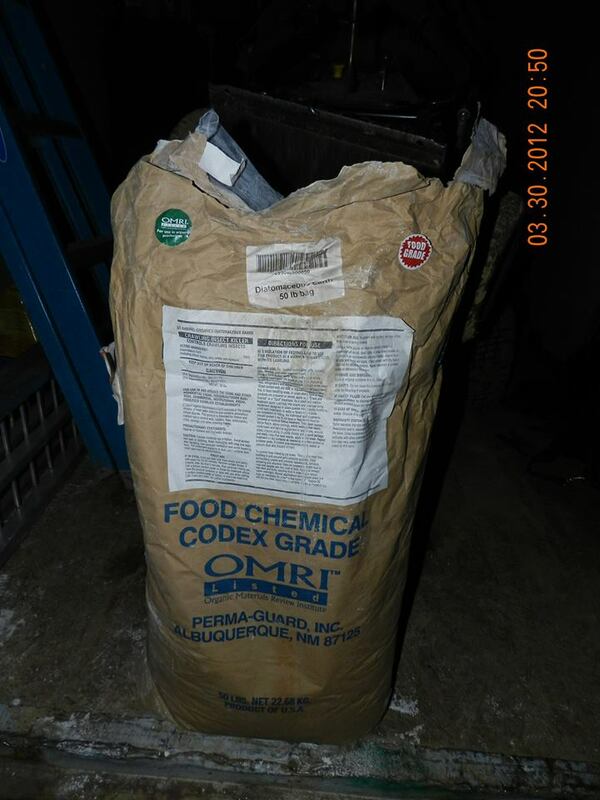 This is why it is important to buy and use ONLY “Food Grade” DE for use in you home, garden or with your pets. In this article when I refer to DE, I am only referring to Food Grade Diatomaceous Earth. 1. Internal Wormer. I give DE every day to eradicate/control internal parasites, such as roundworms, hookworms, etc. To my knowledge DE does not kill heartworms. Some people use DE twice a year, for 60 days at a time. Throughout my research I have found out that DE cleans out bacteria and heavy metals out of the body, also that it continues working in the stool to kill flies. These reasons are why I choose to give it 365 days a year. Here are general guidelines on dosage. I give DE mixed with an egg and any other supplements. I find that feeding it this way is easier and less is wasted than when I sprinkle it on their food. If you feed kibble, have a dog that is prone to constipation or use a brand that has has added Calcium, watch you dog for a few days to make sure the DE does not constipate or dry out their stool too much. I have never had a problem with this but some people worry about it. If this did happen my recommendation would be to reduce your dose of DE, make sure your dog has access to unlimited clean water or if you feed a raw diet, feed a bit less bone daily. 2. Direct Body Application I use DE directly on my dogs to help control fleas and ticks. DE is a mechanical killer, which means it kills via a mechanical/physical means rather than a chemical that kills. DE is made up of microscopic particles that are extremely sharp and these razor sharp particles cut the parasite’s exoskeleton and then the particles dehydrate the insect, due to the DE’s honeycomb hollow shape. DE particles are to small to harm your pet. They are microscopic algae particles! DE is also known to kill bedbugs, and many harmful garden bugs. I use a “puffer”(sort of like a bulb syringe) or pantyhose/knee high to apply DE directly to my dogs. Just pour in about 1/4 cup and loosely tie off the end, then rub the hose over the dogs fur. You want to get it all the way in to the skin. You can use the “applicator” to get the DE all over your pet’s body, including underneath and down the legs. You can also softly tap the stocking against your hand your pet’s body to apply it heavier. Whatever works best for you. Try to do this outside as you should avoid breathing in the dust, it may irritate some people’s(or dog’s) sinus, throat or lungs because it is so fine. If you cant use it outdoors, try to find a well ventilated area.repeat application about twice a week and after baths/swimming. 3. Kennels I use DE in my dogs crates for additional flea control.I clean the tray, then puff some DE then put down the blanket/towel then puff some more DE in on top of the blanket. Do not immediately put your dog in the crate. Do not completely cover the crate with the dog in it, especially until the DE gets worked into the blanket. It may irritate his lungs if he breathes too much of the dust. 4. Yard I use DE on my yard to kill fleas, flies, ants, etc. I usually apply it by hand or with my “puffer”. There are usually directions on the bag for recommended amounts. You can also mix DE with dry sand and use a spreader. DE can also be applied around the foundation of your home to help with pests/bugs. I used the puffer after the block foundation was mostly finished to get the DE around under the house and at the base of the foundation. 5. Chickens/Livestock I keep chickens for eggs and meat for the dogs. I add DE to the Chicken feed. this helps control parasites like worms, giardia and flies. The chickens poo it out and so it continues working to help control the fly population! This also is a organic way to keep the chickens healthy and disease free. We also use DE in our pig’s food as wormer/fly control. I do know that DE works. Here are the details of my DE Experiment. Anyone can do this at home all you need is some DE, a baby food jar or some other see through container with a lid, a flea or two, and a tick or two. Having had a pretty warm winter, flea & tick season is already upon us here in East Tennessee and I do check all four of my dogs for ticks several times per day. After letting my pack out the other morning I found a tick crawling on Cooter’s fur. I grabbed it and put it into the container with some DE. That evening I found a small flea that had hitched a ride on Daisy, into the container it went as well. The tick was vigorous and crawling all over the place when i put it into the jar, within an hour it’s movement was noticeably slower. Within 2 hours it was having serious trouble righting itself if it got turned on its back, and within 6-7 hours it was dead. The flea was small but vigorous as well. Same thing, within just an hour it was sluggish and not moving or jumping as much. Within 3-4 hours it was dead. My conclusion is that while DE id not an immediate kill, it does kill fleas and ticks within a reasonable amount of time. I have read that sn infected tick must be attached/feeding for about 36 hours before it can transmit Lyme Disease. Food Grade Diatomaceous Earth Fresh Water (Fossil Shell Flour) has over 1,500 uses: The natural holistic organic way. In the household, with pets, on plants, around livestock, and for stored grain. It is totally natural and organic and listed with OMRI. Some say “There is no life without Silica”. “Silica is the most important trace mineral for human health!” Silica plays an important role in many body functions and has a direct relationship to mineral absorption. The average human body holds approximately seven grams of silica, a quantity far exceeding the figures for other important minerals such as iron. As it moves through the stomach and digestive tract, it attracts and absorbs bacteria, fungi, protozoa, viruses, endotoxins, pesticide and drug residues, E-Coli, and heavy metals. These toxins are trapped and passed out of the body. In addition, any larger parasites that happen to be in the stomach of digestive tract are “cut up” and killed by the sharp edges of the DE. All of these activities result in a much healthier body with less sickness. We often hear the phrase “I just feel better” with our DE users. This better feeling comes from all the junk being removed from the body and by giving our immune system the “jump start” it needs. 2. Healthier Colon. This is especially important as we get older. A clean healthy colon keeps away polyps, cancers, and ulcers. Today, many are spending thousands of dollars for colon cleaning procedures and products, to do the same thing that DE does. Many users report increased energy and needing less sleep. This is a result of all the food and nutrients that are taken in being better absorbed into the blood stream. With a coated colon–many nutrients never get absorbed. A small amount of Diatomaceous Earth gets absorbed into the blood stream as silica. One of the benefits of Silica is that it helps to destroy bad fats. Everyone that we know that is taking DE has lowered their cholesterol by 40-50 points. Everyone is also amazed at how their high blood pressure goes down. The benefits of silica are many. In today’s grains, there is actually a shortage of silica. Years ago, the silica found in our foodstuffs was adequate, but with today’s hybrids and depleted soils, only about 1/3 of the silica needed is supplied in our food. DE is a simple and inexpensive way to get the silica your body needs. *Help Lower High Blood Pressure! Help Lower High Cholesterol! -Most are reporting 40-60 points lower after only 2 weeks on DE. Osteoporosis is a symptom of the aging process. As calcium in our body system depletes, our bones become brittle and weak. Taking only a calcium supplement can not correct or stop this threatening and crippling disease because the body cannot assimilate and make use of the calcium without the presence of silica. Evidence suggests that, instead of affecting healing, supplemental mineral calcium, on the contrary, accelerates the leaching away of bone calcium and thus hastens the degenerative process of osteoporosis and similar diseases that affect the supportive and connective tissues in the human body. For osteoporosis, silica can stop the pain and even restore the bodies’ self repair process. Silica is responsible for the depositing of minerals into the bones, especially calcium. It speeds up the healing of fractures and also reduces scarring at the site of a fracture. Even when calcium is insufficient, the body can turn silica into calcium that the bones need. problems and injuries including itching, rashes, abscesses, boils, acne, calluses, warts, eczemas, burns, frostbite, benign skin sores, insect bites and bed sores. If you regularly follow a silica regimen, your skin will keep its young look. Hair is nature’s greatest beauty enhancer. Hair at 90 micrograms per gram is almost as rich in silica as are healthy bones, which contain 100 micrograms per gram. Silica is a major component of hair. Using a good silica supplement (such as DE) should be part of your ongoing hair care program for revitalizing hair.Silica helps to prevent baldness, stimulates healthier hair growth and assures beautiful shine, luster and strength. Hardening the enamel, silica prevents cavities and preserves teeth. Silica also prevents bleeding gums, gum atrophy, and recession that causes the loosening of teeth, which could ultimately lead to tooth loss. Silica effectively fights ulceration and the decay of bones and teeth and also lessens inflammation. Your nails are made of protein that grow four to five millimeters per month on average. With silica supplementation, fragile nails become normal within a short period of time. Silica will beautify the appearance of your nails and improve their hardness, making them shinier and less prone to breaking. Silica helps lower bad cholesterol and raises good. Silica helps fades age spots. *DE has a negative charge and bacteria have a positive charge. It is believed that it sweeps bacteria out of the body by trapping it in its honeycomb shaped skeletal form. its positive action on the lymphatic system. Silica works with other antioxidants to help prevent premature aging and to preserve youthfulness. Silica can help normalize circulation and regulate high blood pressure (hypertension). Silica can help decrease vertigo, headache, tinnitus (buzzing of the ears) and insomnia. Dosage: Take 1-2 tablespoons per day mixed in some kind of liquid or food. There is no unpleasant taste. Since it will not dissolve, stirring several times while drinking will prevent settling. Some have experienced higher energy levels, so it is probably better not to take it right before sleeping. No worry about getting too much, any excess silica not needed by the body is automatically eliminated through the blood stream, kidneys and intestines. In my studies and searches of the internet, people are taking 1 or 2 heaping tablespoons of Diatomaceous Earth every day. Myself and my family take 1 heaping tablespoon per day. We mix it with grapefruit juice. Others are mixing it with water, soda pop, juice, or whatever liquid they enjoy. Some are even putting DE in protein shakes, applesauce and yogurt. There is no unpleasant taste. Since it will not dissolve, stirring several times while drinking will prevent settling. Some have experienced higher energy levels, so it is probably better not to take it right before sleeping. No worry about getting too much–any excess silica not needed by the body is automatically eliminated through the blood stream, kidneys and intestines. (NaturalNews) Diatomaceous earth (DE) is a naturally occurring rock made from the skeletons of fossilized diatoms, a type of hard-shelled algae. When ground into a fine powder, diatomaceous earth works mechanically to destroy a wide range of pests, insects, parasites and pathogens by cutting through the exoskeleton, absorbing bodily fluids and causing them to die. 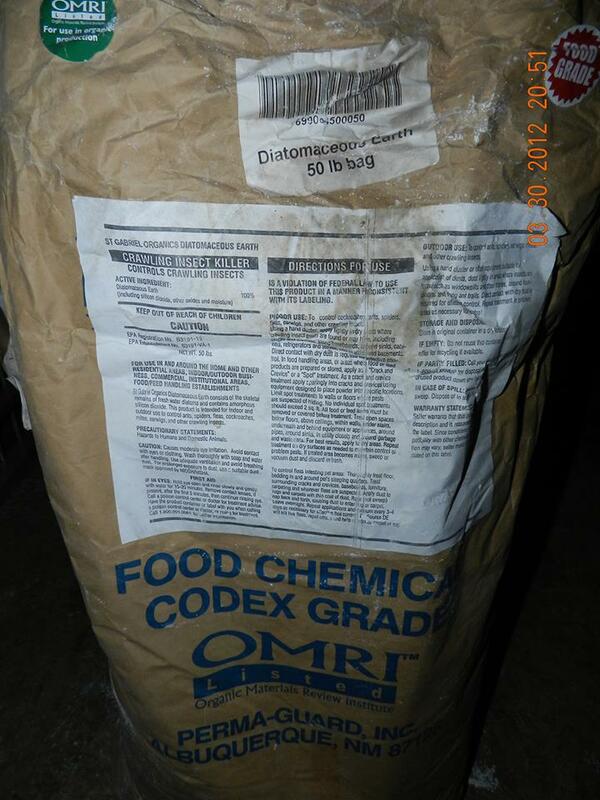 Food grade diatomaceous earth is chemical-free and non toxic. Food grade Diatomaceous Earth is the only grade of D.E. to be used in the following treatments. There are various other types of D.E. such as the type used for filtering swimming pools but only the food grade D.E. can be used as an anthelmintic or dewormer. Food grade D.E. has been used as an intestinal cleanse on both humans and animals. It is often used as a food adjunct in livestock and for pets. The manner in which D.E. eliminates internal parasites is not chemical but rather a physical/mechanical decimation of the parasites. The microscopic sharp texture of the D.E. pierces the parasites’ exoskeleton or skin and the absorbancy of D.E. also dehydrates the lipids of the parasite. This is on a microscopic scale as the texture of D.E. is like talcum powder to the touch. Food grade D.E. is nontoxic to humans and animals even for consumption. D.E. has a negative charge and pathogens are positively charged. Bacteria, pathogens and heavy metals are bound to the D.E. and eliminated through the normal means. Diatomaceous earth is highly regarded due to its ability to absorb viruses, e-coli, organophosphate pesticide residues, methyl-mercury, residues and endotoxins. It absorbs these materials and then sweeps through the colon thus detoxing the body while cleansing the colon. It has full spectrum minerals including the ones that are needed for healthy nutrition. Add the D.E. (food grade only) to the liquid and stir to suspend. Drink immediately. This is a very simple recipe. Diatomaceous earth is not water-soluble so one may find the need to stir it frequently to keep it in suspension. This can be taken first thing upon waking or an hour before or an hour after a meal to prevent the D.E. from absorbing nutrients from the meal. These suggested measurements are twice the normal supplement dosage. This is because the larger dosage is geared towards a deworming/anthelmintic effect. Once the anthelmintic process is complete (2 – 3 months) the daily supplemental dosage can be used. The dosage is cut down to half. Warning: Precautions should be taken in handling D.E. While it is non-toxic the fine powder may irritate eyes and should definitely NOT be inhaled. Some Other Benefits of Food Grade D.E. D.E. is largely silica by content. Silica is required for mineral absorbtion in the digestive process. Silca is used in many processes of the body. Diatomaceous earth has a negative charge and bacteria has a positive charge. It is believed that diatomaceous earth sweeps bacteria out of the body by trapping it in it’s honeycomb shaped skeletal form. Silica supplementation helps repair and maintain vital lung tissues and protects them from pollution. Silica proves effective with female discharge, abscesses and ulcers in the genital area and cervix, as well as mastitis (especially for breast-feeding mothers). Silica can help arterial disease by strengthening the blood vessels. Silica can help avoiding or alleviating Alzheimer’s disease by preventing the body from absorbing aluminum and may flush out aluminum from the tissues. So once one has completed the 2 – 3 month intestinal cleanse it may be beneficial to continue using D.E. as a supplement.